The Portland band played the Roadhouse at the conclusion of last night's long-awaited premiere of Twin Peaks season 3. 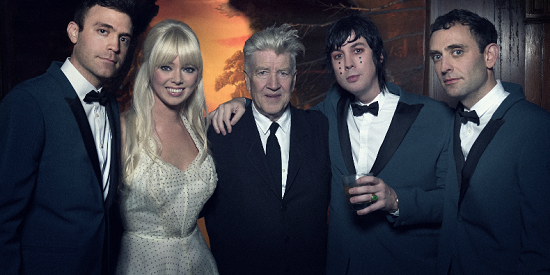 Chromatics appeared on the season premiere of Twin Peaks last night (21 May), playing their 2015 song 'Shadow'. The band have now premiered a new video for the song directed by Rene & Radka, envisioned as a tribute to Twin Peaks director David Lynch, which you can hear above. The video sees the group performing in front of the series' iconic red curtains, and bears the hazy hallmarks of Twin Peaks soundtrack composer Angelo Badalamenti's work, as well as frequent Lynch collaborator, musician Julee Cruise. The band shared an image of themselves with Lynch on Facebook (below), with a simple caption: 'Thank you David.' Their new album Dear Tommy is expected to appear later this year, having been delayed after the band's Johnny Jewel suffered a near death experience in Hawaii. To read tQ's spoiler-free review of the season premiere of Twin Peaks, click here.